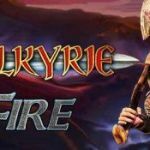 Slot providers tend to build on a successful slot by launching new games with a similar theme or characters. 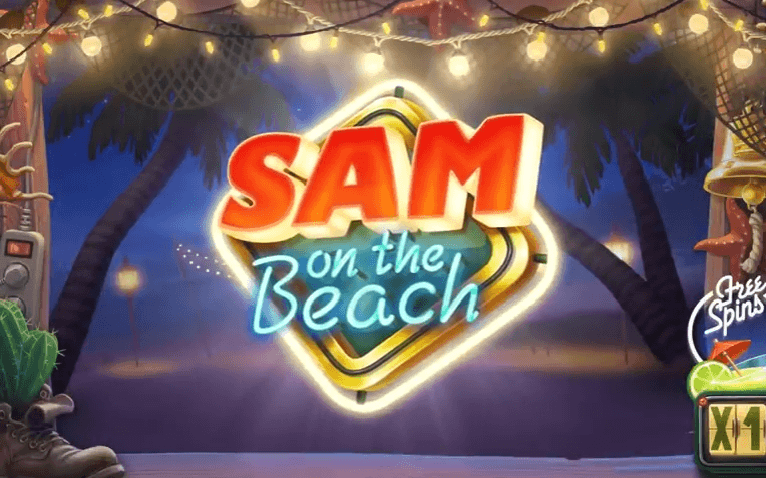 ELK Studios brings us a sequel, this month, called Sam on the Beach. The slot is based on the Electric Sam slot by the same company. The game will be released on 01.02.2017 and players will be able to find it on most major online casinos. 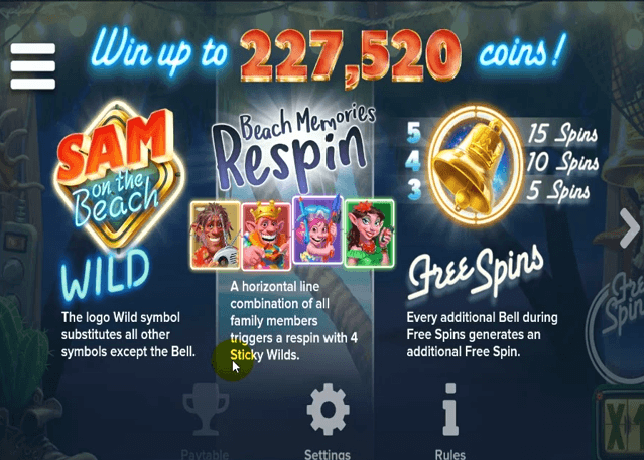 Sam on the Beach is a 5 reels and 243 paylines slot available to play on desktop and most mobile and tablet devices. The game can be played on a max bet of €100 and a min of €0.20. 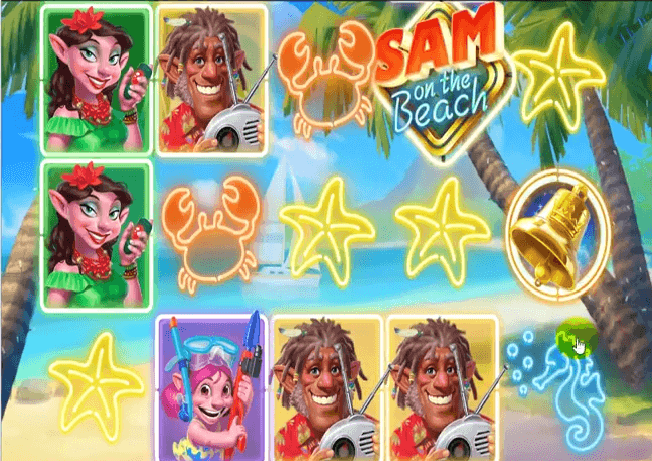 As mentioned, the game’s theme is based on the Electric Sam slot, however this time the gang is on a tropical beach. Blue sky, coconut trees, sailing boats and small islands all appear on the background. The symbols on the reels are all theme related. The high value symbols feature the 4 main characters (Sam, Sandra, Meggie and the new addition Ted). The low value symbols are made of different sea creatures all in the form of neon signs. All symbols can appear stacked on the reels. The scatter symbol is a golden Bell. The wild symbol is the game’s logo and it can substitute for all symbols except the scatter. This feature is triggered when all the characters land on a horizontal line. When triggered, the player will be rewarded with 1 free respin with Sticky Wilds replace the 4 characters. The free spins are triggered by landing 3 or more scatter symbols anywhere in view. The number of free spins awarded depends on the number of scatters landed. For each scatter landed during the free spins one extra spin will be awarded. 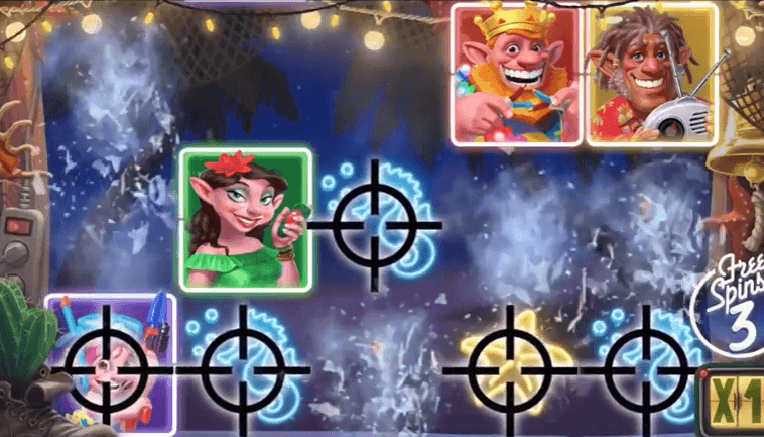 What makes the free spins interesting is that a mini feature will be activated every time a winning combo is made that includes a main character. Sam - When 3 or more Electric Sam symbols land during the free spins, Sam will change one type of symbol on the reels into sticky wilds. The sticky wilds will be active for the duration of the free spins. Sandra - When 3 or more Sandra symbols land during the free spins, Sandra will increase the multiplier by 1 up to 10x. Maggie - When 3 or more Maggie symbols land during the free spins, Maggie will fire her harpoon and destroy all symbols landed. New symbols will fall in their place, thus increasing the chances of a bigger win. Ted - When 3 or more Ted symbols land during the free spins, Ted will award a sticky multiplier up to 3x. This means the multiplier will be active for the duration of the free spins. Sam on the Beach is a high volatility slot with an RTP of 96.3%. 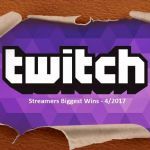 The max wins are possible during the free spins feature and they can be up to 2275 times the stake. 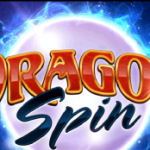 The slot is very similar to its predecessor, however the new features added, make this sequel more unique and give much more potential for big wins. Let us know what you think about the game in the comments. Or join our forum for discussions.